The Wisconsin Alliance for Composers is a non-profit, tax-exempt Wisconsin corporation founded in 1984 to encourage and support the composition and performance of new music by Wisconsin composers. Information on WAC's programs, current officers, bylaws, and supporters. Upcoming events featuring or of interest to WAC members. Who is eligible, what the benefits are, and how to join. Profiles of WAC members, including lists of works. The on-line version of WAC's Newsletter. Past concerts, workshops, and other events. WAC and Wisconsin-centered composer opportunities, and pointers to more comprehensive lists. Other Web resources of interest to composers and new-music fans. WAC presents the Wisconsin New Music Festival 2019, two concerts of music by Wisconsin composers. The 5:30pm concert will feature winners of the WAC Student Composition Contest. 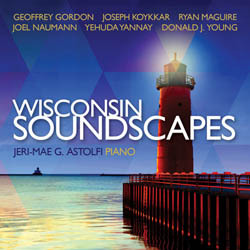 On the Ravello Records release Wisconsin Soundscapes, pianist Jeri-Mae G. Astolfi performs solo piano works by six Wisconsin composers, commissioned by the Wisconsin Alliance for Composers through the Wisconsin Arts Board grant funds, that highlight people, places, scenes, and events chosen by each composer to create a distinctive and vivid portrait of the state. Yehuda Yannay’s Midwestern Mythologist, a six-movement theater work, is a tribute to the composer’s friend Steve Nelson-Raney, a pianist and saxophonist, composer, poet, and visual artist working in Madison and Milwaukee. Donald J. Young’s Three Root River Scenes depicts various imagery of Wisconsin’s Root River, from pleasant afternoons on the banks near the rolling water to the destructive flooding of the river in 2008. Reflecting on three Wisconsin towns, Geoffrey Gordon’s Three Summer Sketches for Solo Piano illustrates impressions of the rich and evocative name of Black Earth, the old mining town of Mineral Point, and the theater and cultural center of Spring Green. Joel Naumann’s variation work Wisconsin 2011-2012: The Political Whirlwind is the composer’s sonic interpretation of the political turmoil leading up to the June 2012 gubernatorial recall election. Ryan Maguire’s Heard, for solo piano uses a reprocessed field recording of a herd of cows in a summer thunderstorm as its thematic material. The three-movement work by Joseph Koykkar, Streets and Bridges, depicts imagery of specific streets and places in Milwaukee from the composer’s past including Downer Avenue, Lafayette Place, and Brady Street. or send an e-mail message to wiscomposers-subscribe@yahoogroups.com. Copyright © 1997-2019 Wisconsin Alliance for Composers. All rights reserved. Last updated 23 February 2019. Contact information.